Typhoid Fever remains one of the most common infections affecting Indonesian population. In Jakarta alone, clinics and hospitals alike encounter Typhoid Fever cases almost every day. Accordingly, Typhoid fever is a global health problem in tropical regions, especially in developing countries. The disease and economical burden of Typhoid Fever continues to be highest seen in Asia. Indonesia is a proud member of the five countries in Asia where Typhoid Fever is endemic. The disease greatly affects children, and may even cause serious complications, including death. However, with the disease being very common, precautions and preventions for the disease remains very low. This may be due to low awareness regarding the availability of vaccines for Salmonella typhi; the bacteria causing Typhoid Fever. to mouth). This happens when unclean hands or objects (including foodwares, utensils) are used to handle food and drinks, and when unhygienic foods are consumed. Foods from street vendors are at high risk for poor hygiene handling and contamination by insects such as flies, roaches, etc. Contaminated water is also a major cause of the disease. The bacteria is ingested into the digestive tract, multiplying and causing damages into the mucosal lining of the small intestine (duodenum). Thus allowing the bacteria to travel, releasing toxins into the bloodstream. The bacteria travels via the bloodstream to your lymph nodes, gallbladder, liver, spleen, and other parts of the body. When poorly treated, some people become carriers of S.typhi. As a result, spreading the bacteria in their stools for years, thus spreading the disease. Who are at risk for Typhoid Fever? Every person, children as much as adult, regardless of gender are at risk for Typhoid Fever infection. The disease is estimated at a prevalence rate of 358 – 810 / 100.000 population in Indonesia. This means that with the population of around 12,7 million people in Jakarta, there are 45,466 – 108,870 cases of Typhoid Fever in a year. This means that in Jakarta alone, there are around 182,5 cases each day. Among these, 64% of typhoid fever infections occur in people aged 3 – 19 year old. However, hospitalization occurs more often in adult (32% compared to children at 10%) and are usually more severe. Deaths caused by Typhoid Fever infection among hospitalized patients varies between 3,1 – 10,4 % (around 5 – 19 deaths a day). Now here’s the thing, Typhoid infection shows an unspecific early clinic symptom. It is important to realize that early symptoms may be similar to other febrile diseases such as Dengue Fever, Malaria, Pneumonia, etc. This contributes to an unclear diagnosis and unspecific treatments during early stages of the disease. The symptoms of Typhoid infection may progress ranging from common gastroenteritis (diarrhoea) to systemic infection and incrementally increasing fever which are life threatening, thus requiring prompt antibiotic therapy. A study in 2013 by Punjabi et al. revealed that Typhoid Fever cases occur nearly all year round with no seasonal pattern. In North Jakarta alone, the study observes 2,887.5 fever cases at clinic or hospitals a year. Among those, the estimated enteric fever cases are at 1/1000 people a year. With this in mind, in the present time, there are more than 4.4 confirmed cases a day (North Jakarta population, 2010: 1,6 million lives). In 2011, a study measures the cost for treatment of Typhoid Fever in 5 Asian Countries. In Indonesia, the average total cost of Typhoid Fever at about 132 USD per episode of illness (IDR. 1,750,000), with the average hospitalized cases ranging up to 432 USD per episode of illness (IDR 5,700,000). This amount far exceeded the average costs of non-hospitalized / out-patient cases which are up to 57 USD per episode of illness (IDR. 750,000). The importance of vaccination and other preventive measures for typhoid fever is heightened by increasing resistance of Salmonella serotype Typhi to antimicrobial agents, including fluoroquinolones, in many parts of the world. While unlike other regions in South East Asia, the level of antibiotic resistant strains of S.typhi bacteria were very low before 2001 when Chloramphenicol was the treatment of choice. However, since 2001, resistance has been rising alongside with the rise in reported cases. This may be due to an outbreak of antibiotic resistant Typhoid Fever. In 2007, resistance to Tetracycline was at 8.13%, Chloramphenicol at 7.84%, Ciprofloxacin at 3.90%. Disturbingly most of all, MDR strains (multi-drug resistant) was rising up to 6.83% cases in 2007, in contrast to 1.21% previously in 2001. Live-Attentuated Vaccine (vaccine created by weakening the bacteria) which is taken orally in the form of capsules, made from the ty21 strain. HPI (heat-phenol-inactivated) vaccine which is parenterally administered (injected to the body subcutaneously) and has been widely used for many years, but is no longer recommended due to higher adverse reaction. The newly licensed “Vi capsular polysaccharide (ViCPS) vaccine” that is parenterally administered intramuscularly, composed of purified Vi (Virulence) antigen, the capsular polysaccharide (a molecule that is linked to the surface of a bacteria) of the S.typhi that is isolated from blood cultures. The ty21a oral vaccine is recommended for travellers from a non-endemic area to an endemic area, with attention to taking it before meal. This vaccine is not recommended for the Indonesian population where Typhoid Fever is endemic. The ty21a notably shows the least adverse reaction compared to ViCPS or HPI vaccine. The HPI parenteral vaccine is no longer recommended due higher rates of adverse effects but is no more effective that the other two vaccines. ViCPS is known to produce mild fever in 0% – 1% recipient, mild headache in 1.5% – 3% recipient, redness in injection site in 7% recipient. However, in recent studies, one dose (25 ug) of The ViCPS vaccine (Typhim Vi; manufactured by Sanofi Pasteur), provided seroconversion (a person having protective antibodies; four-fold rise in antibody titers) in 93% of healthy adults. A trial in Nepal observes vaccine recipients for 20 months, resulting in 74% fewer cases of Typhoid Fever. In a trial involving school children in South Africa who were 5-15 years of age, observed for a period of 3 years results in reduction in the number of cases in years 1, 2, and 3, was 61%, 52%, and 50%, respectively. This is why it is necessary to repeat a dose of the vaccine every three years. In conclusion, CDC and WHO alike recommends the ViCPS Typhoid vaccine (Typhim Vi) for tropical regions where Typhoid Fever remains to be endemic. It is very important to keep in mind that the disease costs us not only health risks, but also death risks and risks of financial loss. If ever we want to reduce the threats of Typhoid Fever, people need to implement an effective prevention method(s), including getting the vaccine and practicing a habit of hygienic food handling. Giannella Ra. Infectious enteritis and proctocolitis and bacterial food poisoning. In: Feldman M, Friedman LS, Brandt LJ, eds. Sleisenger & Fordtran’s Gastrointestinal and Liver Disease . 9th ed. Philadelphia, Pa: Saunders Elsevier; 2010:chap 107. Lima AAM, Guerrant RL. Inflammatory enteritides. In: Mandell GL, Bennett JE, Dolin R, eds. Principles and Practice of Infectious Diseases . 7th ed. Elsevier Churchill Livingstone; 2009:chap 97. Gianella RA. Salmonella. Medical Microbiology, 4th ed: chap 21. Hatta M, et al. Enteric fever in endemic areas of Indonesia: an increasing problem of resistance. The Journal of Infection in Developing Countries 2(4):279-82 · August 2008. Effendi B, et al. Demographic and clinical characteristics of adult patients with typhoid fever in Cipto Mangunkusumo General Hospital, Jakarta. Presented in Coalition Against Typhoid, Bali, 2015. Ochiai RL, et al. A study of typhoid fever in five Asian countries: disease burden and implications for controls. Bulletin of World Health Organization; vol 86: 241-320, 2008. Punjabi NH, et al. 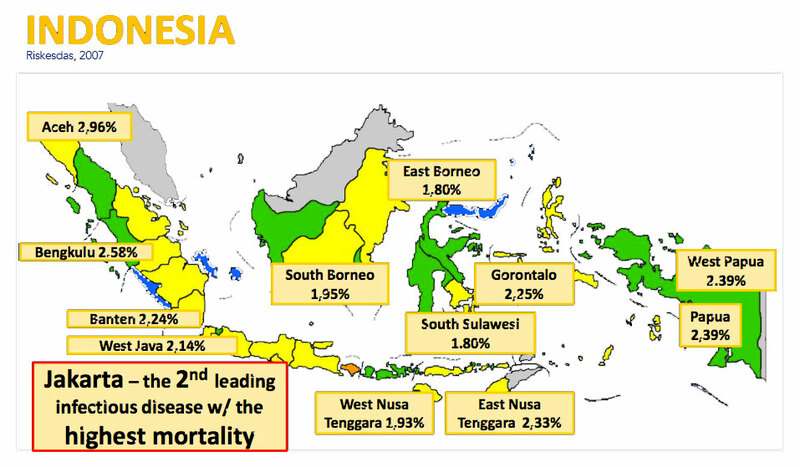 Enteric fever burden in North Jakarta, Indonesia: a prospective, community based study. J Infect Dev Ctries 2013; 7(11):781-787. doi:10.3855/jidc.2629. Poulos C, et al. Cost of illness due to typhoid fever in five Asian countries. Journal of Tropical Medicine and International Health, vol.16;no.3:314-323, March 2011. Jackson BR, et al. Updated Recommendations for the Use of Typhoid Vaccine — Advisory Committee on Immunization Practices, United States, 2015. CDC Weekly, 64(11);305-308. March 27, 2015. DeBuono, et al. Typhoid Immunization Recommendations of the Advisory Committee on Immunization Practices (ACIP). CDC, 1998.